Enter Today - 12/8-12/22! Grab a copy of MaryAnn Diorio's "A Christmas Homecoming" for JUST .99! MaryAnn is celebrating by giving away a Paperwhite Kindle! Details below! Seven Christmases have passed since Sonia Pettit last heard from her daughter Jody. Since Jody's departure, Sonia's world has been turned upside down. Her husband has died of a broken heart, and her son, bitter over his sister's destructive actions, has become rebellious. Jody Pettit O'Dair ran away to experience a life of adventure and excitement, but since her departure, her world has been turned upside down. She's been abandoned by the man she met and married, lost her job, and is unable to care for her two children. With nowhere else to turn, this prodigal daughter begins the long journey home and prays she will be welcomed after walking away so long ago. Find out more about MaryAnn at http://maryanndiorio.com/. This is such a wonderful Christmas story that will put you right into the Christmas spirit! Curl up with a mug of hot chocolate, a cozy blanket and join a family that is experiencing heartbreak, but finds hope, and forgiveness. Jody thought she was missing out on life and left home, actually to another country, with no word to her family. During seven years, so much as taken place in Jody's life as well as the life of her family, including the death of her father. Jody decides to return home with her twins and they arrive on Christmas Eve, not knowing if they will be welcomed or not. Jody must face her fears as well as her guilt for having left so many years earlier when she decides she is going to return home. Jody is not expecting her father to have passed away or the anger and bitterness that her younger brother has toward her. Not only Jody, but her mother and brother as well, learn the importance of forgiveness, hope and love this Christmas. This is a touching story that will remain with you long after you finish reading it. Robin Jones Gunn's Glenbrooke Series begins with book 1 "Secrets." This is a book that I enjoyed and read through very quickly! Jessica wishes to forget her past and move on by starting a new life. However, Jessica's move starts out with an accident right outside of town resulting in a rescue from a very handsome man, Kyle. Jessica finds herself teaching in the local school, becoming best friends with Teri and fighting her feelings for her rescuer Kyle. Adding additional drama is the principal whom wants Kyle for herself and decides to make Jessica's life miserable and other roadblocks that are through in Jessica's way. Jessica finds herself as a part of a missions trip and this is life changing for her in several ways including the most important, finding her way to Christ. Each and everyone of us has secrets of some kind and Jessica is trying to hold onto her secrets and start a new life. I found Jessica to be a great main character as she was so "real," meaning she could be a friend or the girl next door and she was easy to relate to and empathize with. Kyle is also a main character who was great and a man whom I'm sure many would love to have rescue them and fall in love with! However, Teri was my favorite character. There is something about her as she is by no means perfect as no one is, but she is such a loyal friend to Jessica and has an infectious personality. I highly recommend this to anyone who enjoys Christian romance and wants to escape for a few hours to Glenbrooke! Book Review & Party with giveaways! - "No Safe Harbor"
Enter Today - 11/15-12/5! Elizabeth Ludwig is celebrating her new book with a Kindle Fire Giveaway and connecting with readers at a Facebook Author Chat party on 12/6. This is the first book I have read by this author and it will not be my last! I am looking forward to the release of book 2 in Ludwig's Edge of Freedom series. As soon as I opened this book and began to read I was transported back in time in the year of 1897 in New York City. The writing is so descriptive and vivid that I felt that I was a part of the story and Cara's search. Cara and Rourke are both such great main characters. They became real to me throughout the story and I empathized with them as they are both searching for Cara's brother, truth and freedom, as well as battling their feelings for each other at the same time. I do not want to share too much about the story except to tell you to be prepared to want to keep on reading until you have finished the story as there are twists and turns and unsavory characters and situations that will have you cringing, and hoping for truth and discoveries for Cara and Rourke. While I will "officially" start listening to Christmas music the day after Thanksgiving and that is traditionally my day to begin decorating for Christmas, December 1st is really the start to the Christmas season! Being December it seems that Christmas is just that much closer to coming, it is the beginning of the countdown to Christmas (I made Advent calendars for the kids, more on that in another post! ), and now it is really time to think about Christmas shopping and deciding what treats will be made this year! I cannot believe it is already this time of the year, but we are ready for the season and welcoming Christmas! Pattie Mallette shares her story with A.J. 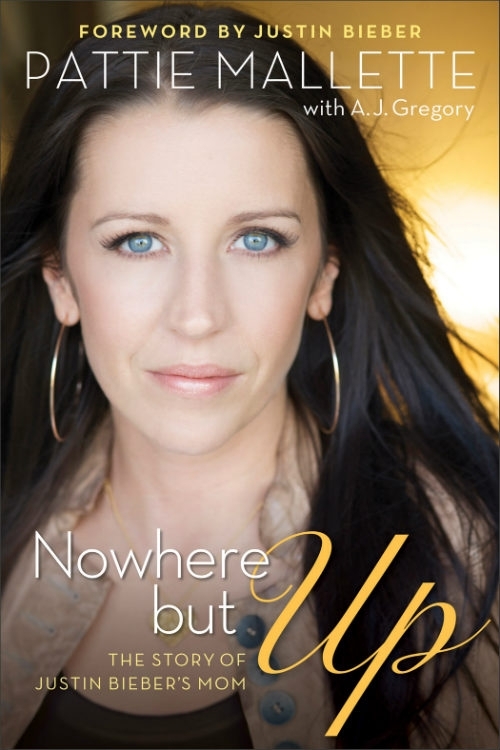 Gregory in her book, "Nowhere but Up: The Story of Justin Bieber's Mom," to reach people and give hope. Pattie's son is well-known and this fame is giving her the opportunity to share her story and life with others. Pattie shares her life from a rough childhood filled with abuse and low self-esteem to becoming a teenage mother to living out her faith and raising her son. This book is very well-written and one that will encourage each and every reader. I highly recommend this for every girl who has struggled with self-esteem, or teenage pregnancy especially. Pattie is using her platform as Justin’s mom to reach people who are suffering and wants her story to give them hope, that when you hit rock bottom, there’s nowhere to go but up. For more info check out the book’s website: www.NowhereButUpBook.com.